P20078260025	The path climbing east from Dagnall. P20078270075	The path leading towards Five Knolls. The Ickield Way is a long-distance trail in the Midlands that follows a series of prehistoric trackways. It links together two National Trails - the Ridgeway to the southwest and the Peddar's Way in the northeast. It is not as glorious a walk as the two National Trails, but has a varied nature that is appealing. Although hardly a classic walk, it is till an easy walk, with lots of accommodation and transport options making circular or day walks feasible. As well as a walker's route, there is also a route for horse riders that varies from the walker's route significantly in places. This file describes a walk along the walker's route. There are also various semi-official extensions to the Icknield Way, particularly to the southwest, and an alternative route through the Luton and Dunstable urban areas. P20078270104	Heading north towards Wingfield. P20079169214	The view from Sharpenhoe Clappers. P20078119084	The River Lark at Temple Bridge. P20078129111	My tent in King's Wood. If you want more details of the path, then have a look at the following book. I used this book throughout my walk, and it proved to be invaluable. 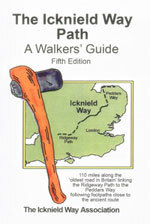 The walk is covered in detail in the Icknield Way Path: A Walkers' Guide, by The Icknield Way Association, ISBN 0 9521819 2 4 published by Icknield Way Association. Click on the image to the right to go to the Amazon page for the book. The association also have a web presence at http://www.icknieldwaypath.co.uk/index.php. P20078260237	Ivinghoe Beacon. P20078260010	The marker stone at the point that the Icknield Way and Ridgeway diverge. P20078260021	The descent down from Ward's Hurst Farm. P20078260031	My tent near Whipsnade Zoo. P20078270043	The path leading past Whipsnade zoo to Whipsnade. P20078270045	Aproaching Whipsnade. P20078270053	Looking west from Dunstable Downs. P20078270060	The view from Dunstable Downs. P20078270065	A monument by the Dunstable Downs visitors centre. P20078270089	Green Lane in Dunstable. P20078270090	Maiden Bower. P20078270093	Sewell. P20078270098	The steep steps leading up to the A5. P20078270109	The path between Wingfield and Chalgrave. P20078270116	Toddington. P20078270124	Heading east from the M1 towards the railway line. P20078270129	A scarecrow in a garden in Harlington. P20079169192	Harlington war memorial. P20079169195	Heading south from Harlington. P20079169202	The view north from the Sundon Hills Country Park. P20079169210	The path leading to Sharpenhoe Road. P20079169227	The Icknield Way heading south to the junction with the historic route. P20079169229	Following the Icknield Way northeastwards. P20079169237	Following the Icknield Way northeastwards. P20079169238	Following the Icknield Way northeastwards. P20079169247	A chessboard on the ceiling of the Motte and Bailey pub, Pirton. P20079169251	Pirton church. P20079169256	The path between Pirton and Ickleford. P20079169264	The River Hiz in Ickleford. P20079169269	Heading east towards Wilbury Hill. P20079169281	An Icknield Way sign in Letchworth. P20079169282	The railway in Baldock. P20077288833	Baldock. P20077288841	The new tunnels carrying the A505 through Weston Hills. P20077288845	The path heading southeast from Baldock. P20077288849	The path climbing up onto Windmill Hill from Clothall. P20077288855	Heading northeastwards towards Wallington. P20077288861	Wallington church. P20077288866	Heading east towards Roe Green. P20077288875	Sandon church. P20077288886	The view towards Therfield. P20077288893	Descending down Therfield Heath. P20077288896	A memorial near the golf club in Royston. P20077288903	The attractive Royston Parish Church. P20077288913	Heading east along the Icknield Way to the north of Barley. P20077288915	The path leading up to Heydon. P20077288923	The path between Heydon and Chrishall. P20077288925	Chrishall village sign. P20077288931	Elmdon. P20077288933	The path between Freewood Farm and Strethall. P20077288938	The path leading northeastwards to the M11. P20077288939	The path leading northeastwards to the M11. P20077288952	Great Chesterford station. P20077118541	the River Cam in Great Chesterford. P20077118543	Great Chesterford church. P20077118557	The path climbing up towards Burtonwood Farm. P20077118568	The descent down into Linton. P20077118569	Detailing on a house by the main road in Linton. P20077118577	The River Granta in Linton. P20077118586	The water tower on Rivey Hill. P20077118590	Looking back towards Rivey Hill. P20077118596	The track leading north to Balsham. P20077118601	Balsham church. P20077118609	The track heading northeast from Balsham. P20077118615	The track heading northeast from Balsham. P20077118622	The track leading towards Crick's Farm. P20077118626	A boggy track leading to Willingham Green. P20077118634	Brinkley church. P20077118640	The Bull pub in Borough Green. P20077118645	The path heading north from Borough Green between paddocks. P20077118649	Dullingham. P20077118664	A train at Dullingham station. P20078119006	A house in Dullingham. P20078119009	The path heading north to Stretchworth. P20078119017	The path leading eastwards from the Devil's Dyke. P20078119025	Cheveley church. P20078119031	Ashley. P20078119036	A pond in Ashley. P20078119042	Heading along the River Kennett towards Dalham. P20078119045	A bridge over the River Kennett near Dalham. P20078119046	he Maltings Kiln in Dalham. P20078119050	Dalham Hall. P20078119065	The track leading north to Heringswell. P20078119075	Tuddenham St Mary village sign. P20078119078	A pond in Tuddenham St Mary. P20078119083	Tuddenham Heath. P20078119094	Icklingham church. P20078119097	The track leading towards King's Wood. P20078119102	The track heading northeastwards through King's Wood. P20078119108	My tent in King's Wood. P20078129114	The memorial commemorating the opening of King's Wood by King Seorge V beside the B1106. P20078129122	The path across West Calthorpe Heath. P20078129124	The path to the east of West Calthorpe Heath. P20078129126	Pigs at the pig farm. P20078129130	The path leading from the A134 to Euston. P20078129132	Euston village sign. P20078129137	The path heading east from Euston. P20078129149	The path heading north towards Knettishall Heath. P20078129152	Heading north across Knettishall Heath. P20078129159	The footbridge over the River Little Ouse. P20078129163	The Peddar's Way heading north to the A1066. P20078129167	Skirting the stables past Brettenham.